We manufacture vertical and horizontal mounting brackets for rescue tools for AMKUS, Hurst and TNT. The brackets are proudly made in the USA to a high quality standard, and come with a hassle-free, limited lifetime warranty. Designed by Vic McMahan, a veteran fireman, to protect the tools, keep them organized and safe, these products make sure that the tools are easily accessible and ready to go when you need them. Also, one of the most common problems today is compartment space. 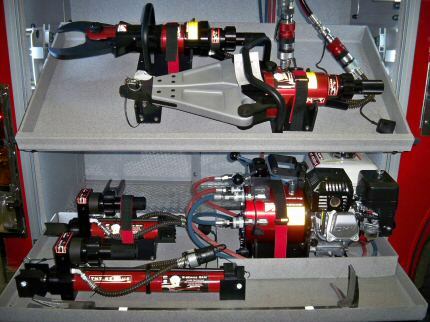 Now you can mount your tools horizontally or vertically, utilizing all of your compartment space. The mounting system is fabricated from eleven-gauge steel and is handsomely finished with a textured baked on powder-coated paint. The result is a durable lifetime product, which will organize and protect your valuable rescue tools. We sell direct to fire departments and offer wholesale dealerships to fire equipment suppliers.